Steve Gagnon, Science Education Administrator, prepares to dip a candle into the top of a dewar containing a small amount of liquid nitrogen. The calendar for Jefferson Lab’s popular field trip program has now been posted. NEWPORT NEWS, VA – Discover why the Department of Energy's Thomas Jefferson National Accelerator Facility is a popular field trip destination for students in Hampton Roads and the surrounding areas. Registration is now open for the laboratory’s full calendar of free Physics Fest events taking place during the 2018-2019 school year. Physics Fest guides students through an exploration of the science of the very hot and the very cold. 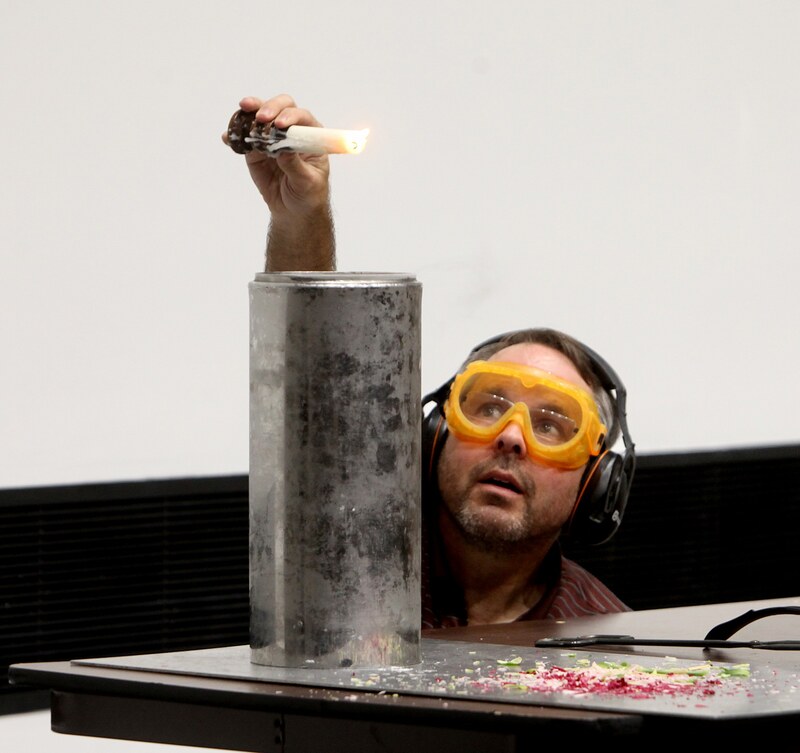 The part-experiment, part-demonstration program features entertaining and educational displays of cryogenics and plasmas. It also helps students learn a little about the types of experiments conducted at the lab and about some of the technologies used to carry out these experiments. “The real draw is typically the fun we have demonstrating the properties of liquid nitrogen and learning about the physics of it. And we never lack for volunteers from the audience to help carry out the demonstrations!” says Steve Gagnon, Science Education Administrator. The two-hour program’s array of demonstrations is designed to help kids better understand scientific methodology and principles. They will learn about the phases of matter – starting with demonstrations using liquid nitrogen at a frigid -321 degrees Fahrenheit, and ending with plasmas. This free program is offered to classes, homeschooled families and other groups. Individual students and groups must be accompanied for the duration of the event by teachers, parents or authorized adult escorts. Physics Fests take place in the CEBAF Center auditorium, located at 12000 Jefferson Ave. Seating is limited for these free, field-trip-worthy events. A reservation is required, and reservations must be confirmed in advance. To register your class for the program, visit the website: http://education.jlab.org/physicsfest/. Those planning to attend are encouraged to download the Physics Fest Classroom Activity Pack, which includes activities written at the 6th-grade reading level that may be used before, during and after the program to reinforce the science concepts presented in the demonstrations. The pack also contains general information about Jefferson Lab, the anatomy of the atom, a vocabulary list with related games and puzzles and data sheets. For security purposes, everyone over 16 is asked to carry a photo I.D. Security guards may inspect vehicles, book bags, backpacks, etc. Links to maps and directions are also available on the reservations page.